For pregnant women, health is important. Exercise is part of this overall health. Done carefully—under a doctor’s supervision—lifting weights during pregnancy is beneficial. While traditional exercise of cardio and regular stretching has its benefits, lifting weights while pregnant provides many benefits to the mom and her baby as well. Lifting proper amounts of weights can keep mom fit and help her maintain healthy weight gain while pregnant. This is important because a healthy weight, along with fitness and a healthy diet all lower the risk for gestational diabetes. Gestational diabetes is associated with overweight babies, an increased instance of caesarean section and a higher risk of developing diabetes later in life. Fatigue and muscle aches are common complaints during pregnancy. Lifting weights can keep the major muscle groups strong, preventing many of the commonly experienced discomforts. Exercise is also associated with better sleep patterns, so plenty of regular exercise can help moms-to-be get a more restful sleep and fight fatigue. Delivering a baby—and recovery—is hard work! Maintaining muscle strength through weightlifting can aid in an easier delivery. As a bonus, weightlifting can help mothers return to a healthy weight, maintain energy levels and resume normal physical activity faster after birth. It is recommended that weight routines target the major muscle groups in the upper, mid and lower back, chest, arms and shoulders, core and lower body. 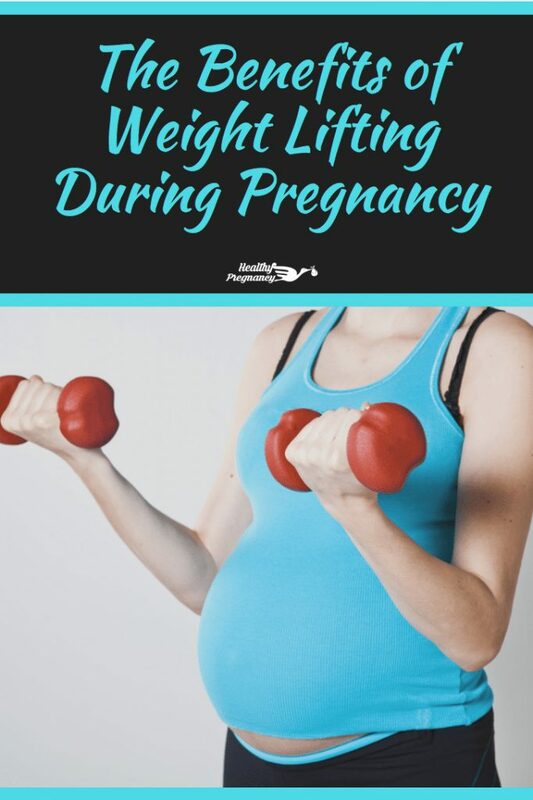 Pregnant bodies come with some special considerations, so it is recommended that free-weights be small, that exercise machines are used where possible to compensate for balance and range of motion changes and that fitness bands be considered a safe option when weight training. Some weight training exercises for pregnant women include the seated cable row, the lateral pulldown and the lateral raise. These can be done with machines or small free weights. These exercises target the mid- and upper-back muscles. For the chest, moms to be can do a chest press in the first trimester. This exercise is not recommended for the second and third trimesters for safety reasons. During the second and third trimesters, pregnant women may try a press out where two small weights are held at shoulder height and pressed forward to engage the chest muscles. Biceps and triceps curls target the arms and shoulders. Standing crunches are safe for the core. From a standing position, a woman will draw the belly button toward the spine, tuck the pelvis slightly and gently squeeze the abdominal muscles. For the lower body, pregnant women can try leg extensions and seated leg curls. As always, pregnant women should check with their health care provider before beginning a fitness routine. In general, there are some safety considerations that pregnant women should take into account when lifting weights. It is recommended that pregnant women use lighter weights with more repetitions. This is because the pregnant body produces relaxin, a hormone that loosens joints. Smaller weights can help avoid overloading these loose joints. Also, because a growing baby changes the center of balance, it is extremely important for a woman to listen to her body and pay particular attention when moving weights so that she does not strike her abdomen or lose balance. It is for this reason that many trainers and doctors recommend weight machines and resistance bands to control the range of motion and balance. It is also recommended that pregnant women not lift when lying flat on the back. As the baby grows, lifting from flat on the back will put pressure on the vena cava—a major vein—causing lack of blood flow to the brain and baby. Though old wives tales warn women against carrying anything while pregnant, many women can safely lift weights and maintain reasonable fitness routines during this time. Under the guidance of a doctor, maintaining fitness is beneficial to both mother and child.